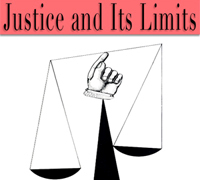 Justice and Its Limits will examine the various ways in which thinking about justice has affected and been affected by recent work in the humanities. The conference will focus on how an understanding of just judgment informs or is ignored in politics, cultural criticism and some crucial aspects of contemporary social life. We trust that by bringing together some of the most thoughtful scholars in the humanities today to concentrate on this theme, we will better understand not only how our various disciplines are connected to the law, but how our attempts to understand and participate in our societies are dependent on our comprehension of justice. "Justice and Its Limits Conference"
• Lucy White (UCLA Law School) -- Respondant to Frank Michelman"
"Modernism, Post Modernism and the Denigration of Vision in 20th-century French Thought"